The data centers that power all the cloud services that you use contain thousands or sometimes even tens of thousands of servers. All these servers, the network switches that connect them to the internet and the UPS systems that keep them powered generate a lot of heat. All of this heat needs to be removed as quickly as possible. An increase by as much as eight degrees in ambient temperature in the room can trigger an automatic shutdown. This is where data center cooling comes in. Data center cooling equipment is physically located in the same space as the equipment it cools. How the air gets to the server and how that air is expelled vary from installation to installation. The most popular method now is to use ducts to send cool air out from directly underneath the front of the servers. This works because IT equipment airflow starts at the front and goes out at the back. Another take on this method is to only cool the area immediately in front of the racks. This is done by placing two rows of racks facing each other w\ith cooling coming from adjustable vents from the floor of the corridor. The two racks are then enclosed so that no cool air gets out. The hot air exits the back of the servers. This has another advantage. In the event of an a/c failure, a rental portable air conditioner can be used in each of these enclosed rack sets, rather than trying to cool an entire data center space. This is just one of the many ways basic data center cooling infrastructure works. 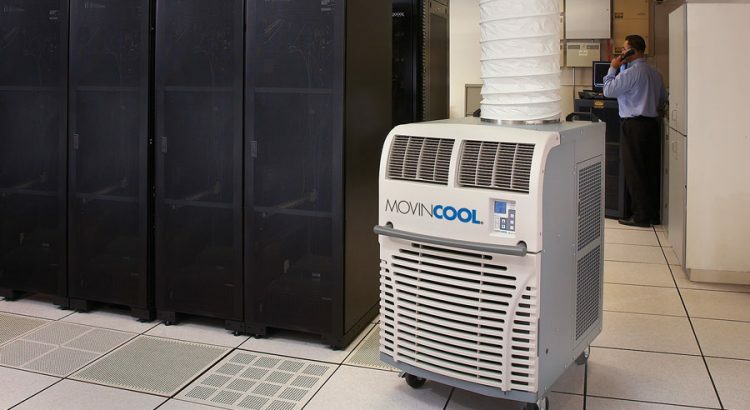 MovinCool is a provider of industrial cooling and computer cooling expertise.